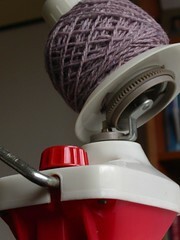 My new/vintage wool winder is fab! Although it would make life easier with a swift as well, but I’ll have to do without for the moment. I’ve googled and done some searching but can’t seem to find much about the age of it. I’m guessing 1960s or 1970s but it didn’t have an instruction leaflet that may have given me more clues. 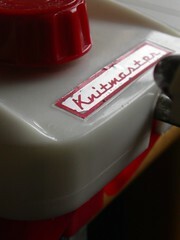 I know that Knitmaster made knitting machines but they appear to have ceased trading. It’s great fun, even Mapman thinks so! 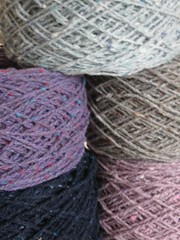 Here’s some I made earlier with some of the yarn from Mystical Stripe.